Yes a Volvo blog! I work in a small town in the sleepy Suffolk countryside about 10 miles from the centre of Ipswich, not exactly the best place for truck spotting. 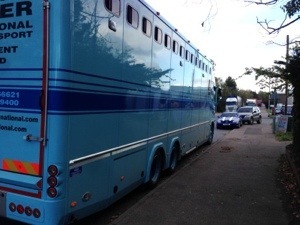 Top international owner driver Matt Campbell (him with the Rizzla blue DAF) was loading for us in Hadleigh today, well I thought he was but actually he was at the burger van. So a burger van in little ol’ Hadleigh and who else should happen to be parked there?? 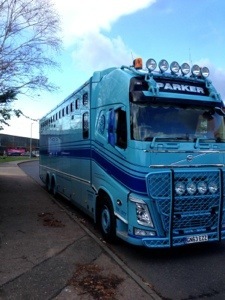 That’s right John Parkers brand new Volvo FH Horsebox. Yea 100 yards from my office, but could I get out to see it? could I bugger. Phones went crazy and by the time I got out the bloomin ‘Orsebox had gone. I have seen it at the Retro Truck Show at Gaydon and it really is an awesome looking truck. Thanks to Matt for the photos. This entry was posted in Drivers Photos, Volvo by truckbloguk. Bookmark the permalink. Hope it wasn’t delivering the meat for the burgers!